There does not seem to be any significant difference between the ordinary “Promenade Dress” and the one designated for the sea-side. As the latter are most often shown in prints dating from the months of early autumn, when many of the social elite headed for the sea-side, one could conclude that these prints simply reflect the desired setting of the moment. 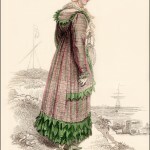 Though the print is labeled “Evening Promenade, or Sea Beach Costume,” neither figure appears dressed for evening, and the magazine description leaves off the word “Evening.” This sort of discrepancy is not uncommon, and is seen in all the magazines of the period. As the prints were produced separately from the magazine text and inserted later, it could be that the text was changed while the plates were being produced and colored. 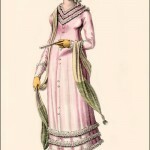 “First Figure: A Grecian wrap gown, with high Armenian collar, bordered with treble rows of narrow muslin, or with three rows of appliquéd beading. An Egyptian tunic of pink or lilac shot sarsnet, ornamented up the front with silk cord buttons; round the bosom and cuffs to correspond. A hamlet hat of white imperial chip or straw, tied across the crown with white or lemon-coloured ribbon. 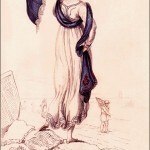 A foundling cap of lace, exhibited in front, ornamented with corn-flowers. 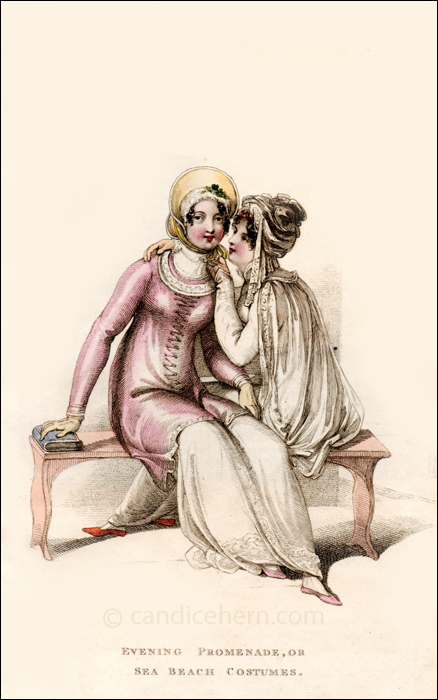 Pale tan gloves, and shoes the colour of the pelisse.